Israel draws its water from three sources: surface water, groundwater and alternative sources (desalination and wastewater reuse). Currently, surface and groundwater still form the main sources of water supply (Fig. 4). However, recent developments in desalination and wastewater reuse technology herald a shift away from natural to alternative sources so that Israel will be able to meet future demand and protect its natural water resources. On average, Israelis dispose of about 93 m3 of fresh water per person per year. In Israel, desalination plants using reverse osmosis technology treat seawater for drinking-water purposes and brackish water for agriculture. Today, desalination accounts for approximately 42% of the country’s drinking-water needs. 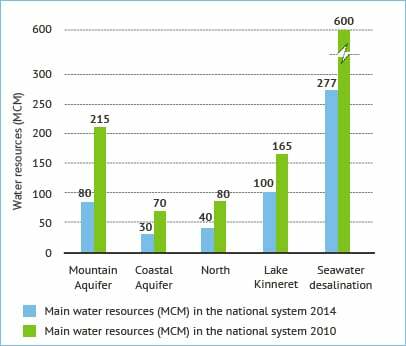 Desalinated water production has increased significantly since the first desalination plant in Ashkelon started supplying water to the grid in 2005, with production increasing from 277 MCM/yr in 2010 to around 600 MCM/yr in 2014 (Fig. 4). Going forward, the target is to produce 705 MCM/yr of desalinated water by 2020 and 1.75 billion cubic metres per year (BCM/yr) by 2040. Desalination is considered essential to maintain a sustainable water supply for the population. 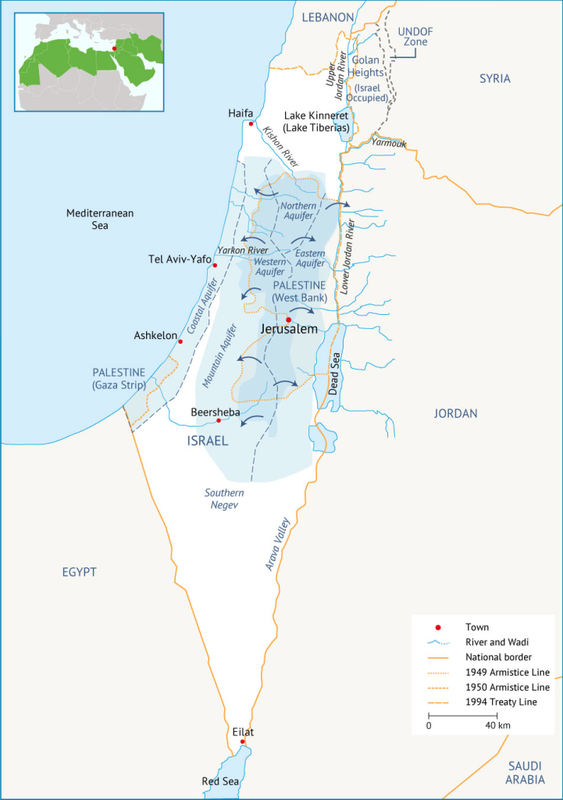 The Israeli government also plans to use desalinated water to replenish declining natural water resources. Most desalination plants in Israel are privately owned. While the energy requirement for reverse osmosis desalination is high, Israel is maximizing on energy recovery and reducing production costs by powering desalination plants with natural gas. Wastewater reuse is an important source of water for agriculture in Israel. Wastewater that is treated and used for irrigation is known as effluent. Of the 507 MCM/yr of wastewater produced, 468 MCM/yr (93%) is treated and 410 MCM/yr (85%) is reused in irrigation. Domestic sewage is collected and treated by Israel’s national water utility, Mekorot, or by private companies. Private wastewater treatment facilities normally operate in smaller outlying communities whereas Mekorot treats sewage from the larger urban centres. Israel aims to more than double the amount of wastewater that is produced for the agricultural sector by 2050.